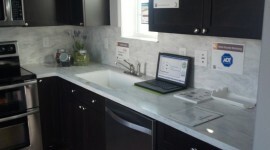 We offer a multitude of choices for your counter top needs including solid surface, stainless, and wood counter tops. We do more than just install new counter tops for our customers. Ask about counter top repairs and remodels. Get in touch with us or stop by our showroom. Wellcraft Fabrication Inc. is a women-owned and operated business in Jacksonville, FL. 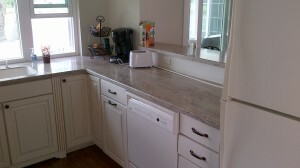 We have been providing quality Solid Surface Counter Tops, at a reasonable price since February 2003. We handle both residential and commercial work, and know what it takes to satisfy our customers. As service professionals, we understand that time is money on a job site. If you need materials delivered in a timely manner, measured correctly, delivered accurately and installed easily the first time, look no further than Wellcraft Fabrication Inc. to fulfill your solid surface counter top needs. It is, and always will be, a priority to listen to what the customer’s wants and needs are and then advise them about the best available options. The goal is to make our customers happy, to create and execute a look and design that will meet or exceed the customer’s expectations. Our finished products are not just limited to Solid Surface Counter Tops. We can create a wide variety of offerings based on your needs, such as table tops, wall cladding, thresholds, showers and outdoor areas. If you want counter tops that give you convenience, practicality, rich aesthetics or all the above, Wellcraft Fabrication Inc. can visualize your project and make your dreams come true.